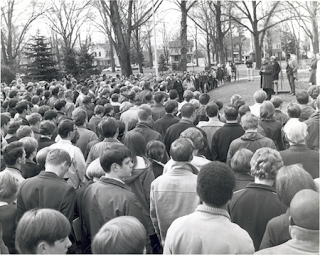 Christened as the “Hope College Memorial Chapel” at its opening ceremony, the campus’s home for worship was renamed “Dimnent Memorial Chapel” in honor of President Edward Dimnent, who presided over the chapel’s opening ceremonies. While attendance was initially required of all students, current students participate of their own volition. In 1997, Student Congress President Ryan Cook founded a school initiative to mend the church’s moldered chimes, demonstrating the extent to which youth care for Dimnent Chapel. Nearly 1,000 students attended the service and heard President Edward Dimnent’s dedication speech. The chapel’s construction cost totaled $250,000. Today, such a venture would accrue expenditures of $3.5 million. Despite these economic obstacles, Hope College completed the project without acquiring debt. 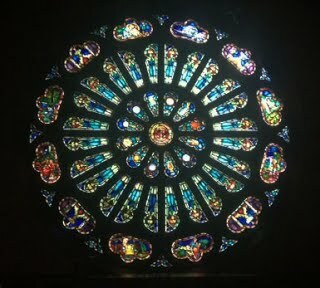 The chimes, housed in the chapel’s south tower, were $12,000 and of a quality that “no city in Michigan outside of Detroit has a set that will equal these.” The rose window, gifted by the Class of 1916, is a prominent feature of the chapel. 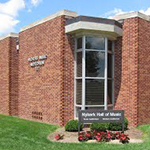 In the winter of 1971, Hope College was given a Dutch tractor organ that was worth $42,500 to use in Dimnent. A generous gift, Hope’s new organ filled an important gap and served as a substantial tool in worship services. In 1997, Student Congress leader Ryan Cook conducted an extensive campaign to mend the chapel’s ancient tower chimes. The musical chimes were rededicated in a ceremony at which Cook himself orated the benediction. In 2005 the Holland Sentinel reported a $750,000 job initiated to bring the primary organ back to original condition. Today, the instrument is played during the chapel’s regular services. H88-0393, Dimnent Memorial Chapel, Papers, 1920-(ongoing), Joint Archives of Holland, Hope College, Holland, MI. H88-0040, Dimnent, Edward Daniel (1876-1959), Papers, 1892-1972, Joint Archives of Holland, Hope College, Holland, MI.